Artist’s rendition of a terraforming process on Mars. With all this talk lately of Elon Musk and SpaceX trying to colonize Mars, a lot of skeptics are quick in poking several substantial holes in this futuristic vision of humanity. Long story short, Mars is inhospitable to human life, any way you slice it. Its surface is (largely) dry and arid, its atmosphere tenuous and toxic, and its temperatures are far from a walk on Miami Beach. Despite all of this, scientists and engineers seem pretty certain that life on the Red Planet is not only likely in the future, but inevitable. From a scientific perspective, human life on Mars could probably tell us more about the solar system’s past, as well as the history of our own planet, than we could ever learn from living on just one world. It would also be a phenomenal stepping stone in the conquest of exploring other worlds. Theoretically, we could use a human settlement on Mars as a template for future colonization missions, perhaps even to extrasolar systems. Mars could also serve as a vital pit stop for interplanetary missions in the not too distant future. Finally, having an entire species confined to one planet is simply asking for humanity’s annihilation. However, as we know it today, Mars would not be an easy place to live. From a biological standpoint, setting up a settlement on Mars today would be no different from setting one up on the Moon. In the far future, it will be necessary to terraform the planet in order to more easily function on Mars’s surface, and for it to more readily serve as a second home for humanity. Terraforming is a process by which a planet’s biosphere is altered with technology in order to make it more suitable to human and Earth-based life. Terraforming an entire world demands that many factors about the planet’s atmosphere and surface be changed in order to accommodate such life. There are four main factors that need to be addressed in order for this process to occur: atmospheric pressure, atmospheric content, temperature, and liquid water content. If we look at Mars’s current atmospheric and planetary attributes, we can see that it is a far cry from being Earth-like. Its atmosphere is only 6.4 mbar (~1/200 of Earth’s) and is nearly entirely composed of CO2. It has no stable liquid water sources, with small pockets of liquid water forming only briefly before either being frozen into the soil, or evaporated into the thin atmosphere. Mars is cold too, yielding an equilibrium temperature of only 215 K (-58 C). This temperature, however, is warmer than one would expect for a rocky planet at Mars’s distance. In fact, if you crunch the numbers using the Stephan Boltzmann law, you find that Mars is in fact 3 K warmer than it should be. This is because its atmosphere is composed almost exclusively of a greenhouse gas, our aforementioned CO2. Even this extremely thin layer of CO2 raises the temperature by 3 K, which is noteworthy. Mars is also remarkably Earth-like in that it has two icy polar regions. Mars’s North pole is much akin to Antarctica, being composed of water ice and similar volatiles. However, contrary to what one might think, the South Pole of Mars is actually much more promising to life on the Red Planet. This is because the South Pole of Mars is made up almost entirely of CO2 ice, trapped in a solid shell on the bottom of Mars. Now you can see where this is going. A study by Robert Zubrin and Christopher McKay in 2005 found that if the South polar cap was completely sublimated using some form of terraforming device, that it could release as much as 100 mbar (0.1 atm) of extra pressure into Mars’s atmosphere, exclusively CO2. The current temperature of Mars’s South pole is about 142 K, which is surprisingly close to the sublimating temperature of CO2 at Mars’s current atmospheric conditions. 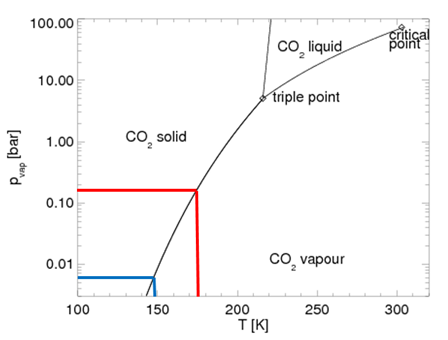 Pressure-vapor curve for CO2, the blue lines showing what temperature is needed to sublimate CO2 ice on Mars (148 K), and the red lines showing the maximum pressure/temperature on the pole after the South Pole has evaporated into the atmosphere. At 6.4 mbar, we only need to increase the temperature of Mars’s south pole by about 5.5 K to start the sublimation process of the pole. After this temperature is achieved at the pole, more CO2 will saturate the atmosphere, further increasing the temperature and pressure, and so on until the entire pole vaporizes into the air. After this process occurs, the equilibrium temperature and pressure of Mars will be about 225 K (-48 C) and 106.4 mbar respectively. Now we’re really cooking, because as it turns out, there is another 300 mbar of CO2 frozen in Mars’s regolith, or soil. Once the South Pole has completely turned to vapor, Mars’s equilibrium temperature will raise high enough to the point that this CO2 will no longer be confined to the icy clutches of the Martian regolith, and it too will be sublimated into the atmosphere. 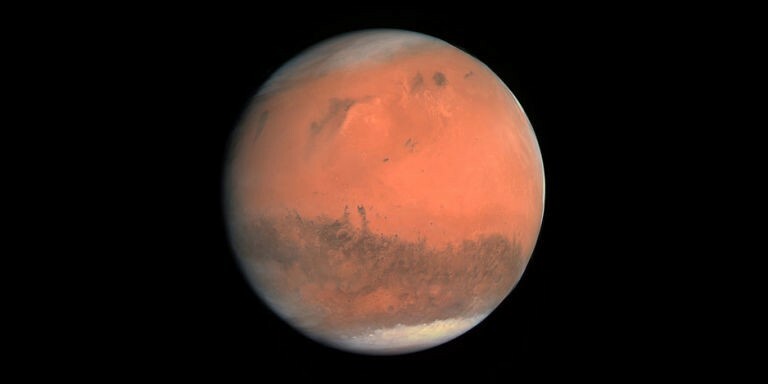 This will consequently raise the atmospheric pressure of the Red Planet to 41% that of the Earth’s, and will in fact increase the temperature of the equator to be above the freezing point of H2O when Mars is at its perihelion (when it is closest to the sun)! This entire process, however, presumes the presence of a futuristic terraforming device that has the capability to increase the temperature of Mars’s South Pole by 5.5 K. Well, the truth of the matter is, this device doesn’t have to be quite so futuristic. A massive, reflective mirror placed in the correct orbital configuration just might do the trick. To reflect enough sunlight to melt the pole, this mirror (or series of mirrors collectively) would have to have a surface area of 3*10⁹ meters, or about the surface area of the state of Rhode Island. Considering that we currently only have the capacity to launch payloads of a few tens of tons, we have have a lot of work to do to before we can endeavor on such a project. 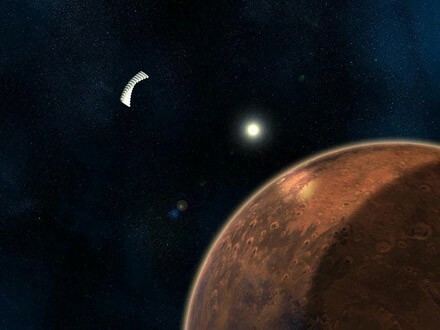 Artist’s impression of a Martian terraforming mirror. Once all of Mars’s CO2 has been vaporized into a healthy atmospheric shell around the planet, the real terraforming can begin. Photosynthetic life can be planted and grown to aid in the transformation of the atmosphere to be more friendly to human life by providing oxygen. This, however, has the immediate negative feedback of stealing away the precious CO2 which provides the greenhouse heat for said plants to survive. To counteract this, CFC (halocarbon) facilities would be required to manufacture replacement greenhouse gasses in order to take the place of some of that CO2 (yes, this is the opposite of what we need to do here on Earth). But plants also need water to survive, which is another problem for terraforming Mars. Mars has plenty of frozen water, but after we have increased the temperature and pressure enough, this water will become a liquid. Water, in its liquid state, actually decreases the greenhouse effect by reflecting sunlight back into space, which would have otherwise been absorbed by the planet and turned into infrared radiation for our greenhouse gasses to capture. This is another issue that would need to be addressed by our CFC manufacturing facilities. Finally, CFCs themselves have the problem of depleting ozone, which is necessary to block the malicious assault of UV radiation emanating from the sun. A healthy, balanced mixture of plants, water, and CFCs would be required to coexist in Mars’s biosphere in order for the terraforming process to occur correctly. Once this process is completed, all four of the planetary factors will be correctly addressed and altered to allow for Earth life on the bare surface of Mars. 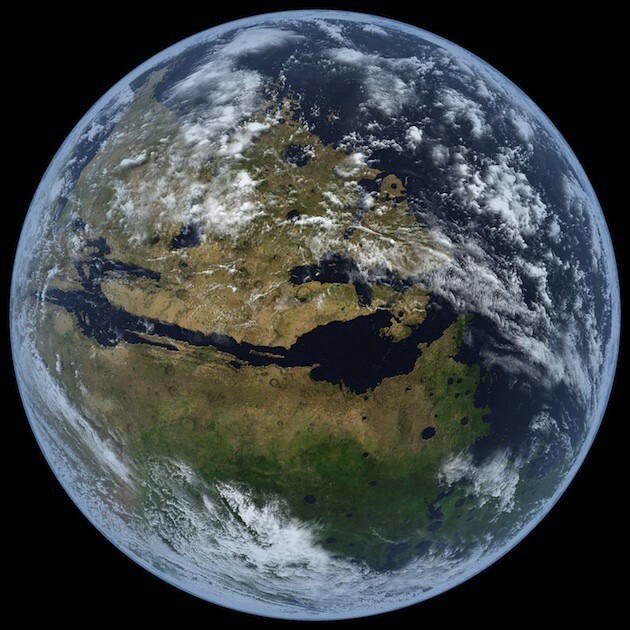 Artist’s rendition of a healthy, terraformed Mars. The technology and the materials necessary to terraform the Red Planet are here today. It’s only a matter of time before some billionaire entrepreneur space enthusiast (cough, cough) builds up the necessary resources and motivation to get the proverbial terraforming ball rolling. 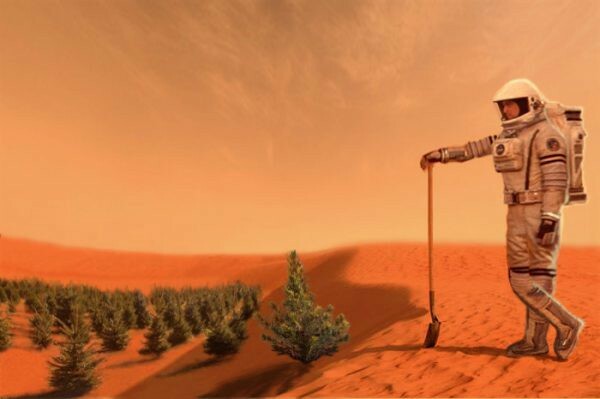 There are some potential snags in the introduction of plant life to Mars’s ecosystem, but nothing that a more advanced, future version of humanity couldn’t overcome. Once we had succeeded in completely terraforming Mars, what would be next for our species? At this point, Mars would be its own, self-sustaining world, completely independent of the resources of Earth. No natural nor man made phenomenon would have the capability to stop the advancement of humanity outwards and towards the stars. At last, we would be an interplanetary species. The universe is vast, and demands our exploration. Mars is simply the first of potentially thousands of steps in our endeavor to become a greater species. One day, humanity will leap towards the stars in an attempt to learn and discover more about the universe, and more about ourselves in the process. 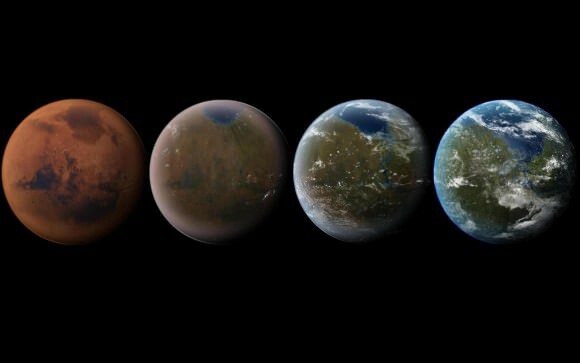 The universe is our neighborhood, and terraforming Mars is like opening the front door. Time is a dimension. Space is a frontier. We use one to study the other, and both to study ourselves.